Detailed guide with helpful information on fees, costs, requirements, licenses, formation, marketing, and hiring. Also includes tips, FAQs, and checklist. Trucking companies make shipping more efficient by moving goods from suppliers to distributors quickly over long and short distances. Starting a trucking company can be costly, but it is a business that meets a critical need in the market. Because the United States has such a strong infrastructure of major roads and highways, trucking is still the primary means of transportation for freight. In fact, truckers haul approximately 70% of the nation's freight. For anyone who owns a trucking company or is thinking about starting one, this is good news. Below you'll find steps and tips for starting a trucking business. You will also find frequently asked questions about the industry, so read on to learn more. How much do trucking company owners make? Many owner/operators have gross earnings of $185,000 per year, but their profits may only be $40,000 to $50,000 after expenses. However, owners of larger trucking companies with major fleets could earn millions if they have a large enough profit margin. In the trucking industry, there are many moving parts (no pun intended). Managing drivers, vehicles, deadlines, delicate goods, and various other logistical challenges can be difficult. Writing a business plan will help you create an operational strategy to refer to when your business is up and running. Writing a business plan for your trucking company will force you to address important questions that you need to have answers to before everything is up and running. With a good business plan, you'll already have a clear sense of how your company will function, what your staffing needs are, how much money you need to raise, what your projected profits are, and so on. Investors and business partners will need all of this information as well if they are going to get on board with your idea. 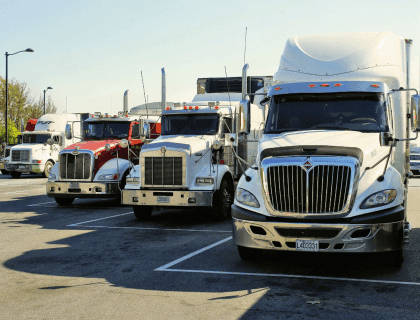 How much does it cost to start a trucking business? Costs can vary greatly based on the scale of your business, but it is likely that it will cost you between $10,000 and $20,000 to start a trucking company. This includes the downpayment on a truck, insurance, State and Federal registration, and other fees. 2. Form a legal entity. Most entrepreneurs choose to start their trucking business as an LLC. 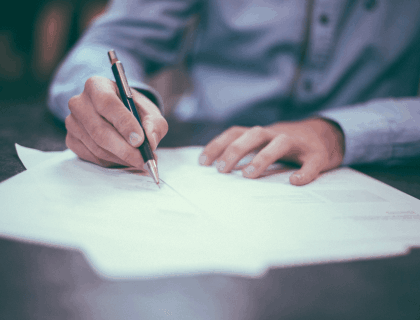 The advantage of creating an LLC is that it can be used to shift liability to your business while allowing you to retain personal assets that may be used for business purposes. The tax structure of an LLC is also more efficient than a sole proprietorship. Forming an LLC is easy. To form an LLC for your trucking company, all you need to do is appoint a registered agent - someone who is the State's official contact person for the company. This can be you, the business owner, or someone else who will be working with you. As an LLC, you'll also need an Employer Identification Number, which you can obtain by filling out the application form on IRS.gov. 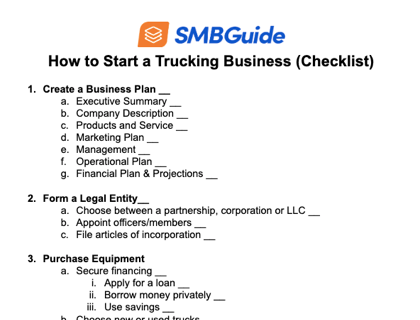 Use this free checklist as a convenient point of reference when you are ready to start your own trucking business. Obviously, a trucking company needs trucks. Transport trucks are expensive, but they are a must if you want to offer transportation services to suppliers and distributors. Perhaps you are going to start with one truck and build up from there, or maybe part of your plan is to purchase a small fleet right away and recoup the cost over time. You can purchase new or used trucks, just remember that you want equipment that is safe and will have minimal maintenance costs. It may be tempting to buy an older truck, but in the long run you may spend just as much money on repairs. A truck will cost you anywhere between $15,000.00 and $175,000.00, but you can secure a small business loan if you need financing. With financing, a downpayment of between $1,000.00 and $15,000.00 will usually still be required. Do I have to pay for a DOT number? A Department of Transportation number is mandatory for all trucking companies. It costs $300.00 to file for a DOT number with the Federal Motor Carrier Safety Administration. US DOT Number: A number from the US Department of Transportation that identifies your company. CDL: A CDL is a commercial driver's license. All of your drivers must have a CDL to operate one of your vehicles. Motor Carrier Operating Authority Number: Registration number issued by the Federal Motor Carrier Administration to companies that transport passengers or commodities. International Registration Plan and Fuel Tax Agreement: Necessary for trucking companies operating in multiple states/countries. Without these certifications in place, you run the risk of being fined or having your trucking company shut down, so make sure that you have all of them before your trucks hit the road. What documents do I need to start a trucking company? Truck drivers must be qualified. When you are hiring drivers, it is important to make sure that they have a Commerical Driver's License and that they have all of the necessary safety training to operate a transport truck. Trucking companies can run into serious liability issues in the event of an accident, so you want drivers who are well qualified to do the job. 6. Purchase insurance for your fleet. Of course, you hope that an accident never happens, but if it does, you should have the right coverge in place to protect your business. You can learn more about finding the right insurance by checking out our small business insurance article. Can I start a trucking company with one truck? If you are wondering how to start a trucking company with one truck, the steps are exactly the same as the ones listed above. Even a business with only one truck needs to comply with all of the industry standards and regulations. You can use the same steps listed above if you want to know how to start a small trucking business. Is owning a dump truck profitable? Maintenance costs for dump trucks are high, but dump truck services are always in high demand. Calculate your hourly costs for using the truck (fuel, insurance, registration, etc.) and then make sure you are charging more per hour than it is costing you to operate. This way, you are guaranteed to be profitable as long as you have customers who want to pay for your service. Purchase insurance for your fleet. How do I start a trucking business as an owner/operator? An owner/operator is someone who owns his or her own truck and drives it themselves. 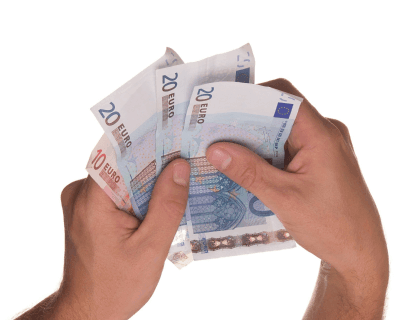 Other companies pay an owner/operator to transport goods. 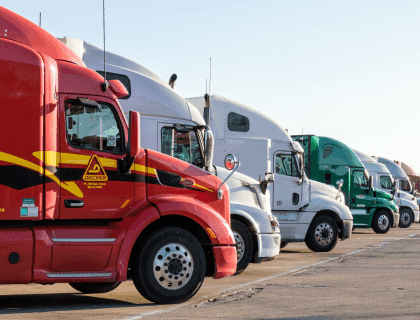 An owner/operator is still essentially a small business owner, so becoming an owner/operator involves all of the same steps that you would take when setting up a trucking company. The primary difference is that you have only one truck and no employees. Can I start a trucking business with no money? Transport trucks are expensive, so you need an alternative cash source if you don't have the money to purchase a truck. 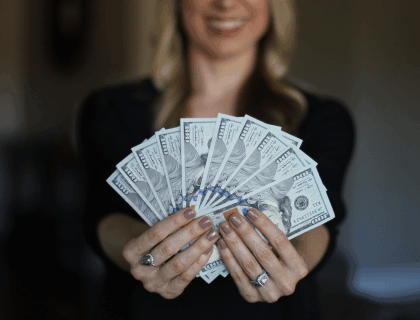 Many entrepreneurs use a startup loan to cover their initial costs. The highest paying truck driving jobs are usually with private fleets. For example, big companies like UPS and Wal-Mart have their own trucking fleets. Companies like this pay drivers generous annual salaries of $70,000 to $85,000. Trucking companies have very high fuel, equipment, insurance, and labor costs. 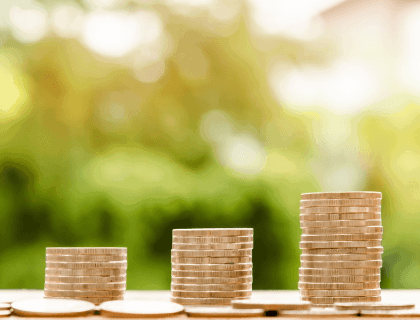 A trucking company can be profitable, but only if these costs are carefully managed and there is enough cash flow in the business to handle monthly expenses. 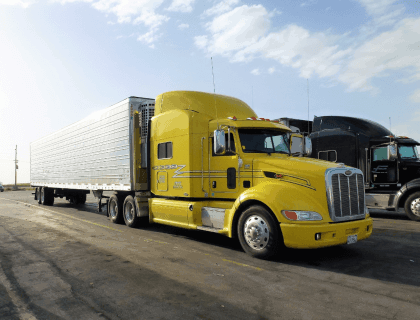 How do I start a successful trucking business? A successful trucking business requires careful planning and good financial management. You can follow the steps above to learn how to start your own trucking business from scratch. 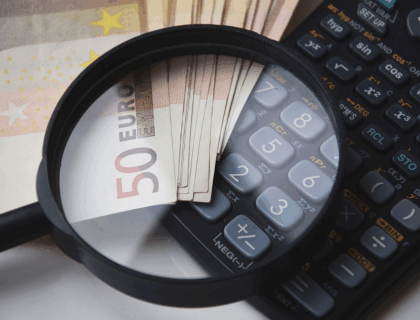 What is the profit margin for a trucking company? Trucking companies in the United States have an average profit margin of approximately 6%, according to The SMB Guide research. How long does it take to get operating authority? If all of your documents are in order, operating authority is usually granted within 20 days of your initial application. However, you still need a State registration before you start trucking, and this could take 2-3 weeks. How much does an 18-wheeler cost? An 18-wheeler has two parts: the cab and the trailer. A new cab costs between $130,000 to $180,000, while a new trailer costs between $30,000 and $80,000. How do I start a trucking broker? Write a business plan for your brokerage. Obtain a US DOT number and Freight Broker License. Buy a Freight Broker Bond from the government. Purchase cargo and liability insurance. Designate process agents in any state where you do business. How do I start a trucking company LLC? You can create a trucking LLC by following the steps above. Typically, you need to file articles of organization with your State and pay a small fee. Trucking may be a competitive space, but all of the numbers indicate that the economy relies heavily on trucking companies to move goods from point A to point B. If you want to start a trucking company, follow each step closely and make sure you pay attention to State and Federal compliance. To learn more about starting your own business, check out How to Start a Business.